Dairy Free Crème Brulee- rich and creamy vanilla custard with that perfect caramelized sugar crack. Easily made in your Instant Pot, or in your oven. Some desserts are easily made gluten-free, because they are naturally gluten free. 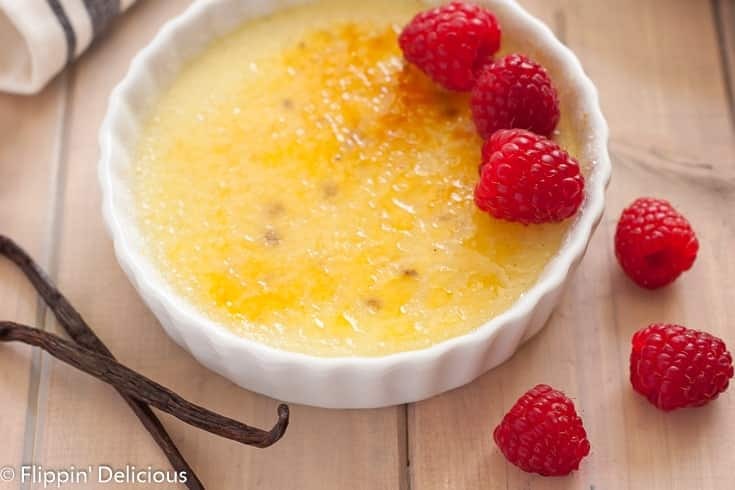 Crème Brulee is one of those decadent, naturally gluten-free desserts. Which is awesome. Until you can’t eat dairy. It seems like all the naturally gluten-free dessert options are very dairy-full. Ice cream, pudding, gelato, and of course crème brulee. Dairy free vanilla crème brulee can seem challenging to make, but it really isn’t very complex. The mark of a good crème brulee is a creamy, silky smooth mouthfeel and the crack of the caramelized sugar on top. If you are a pumpkin fan, you have to try my dairy free pumpkin crème brulee recipe! It has the same texture as this vanilla custard, but with the festive flavors of pumpkin, cinnamon, nutmeg and ginger. Do you try and eat low carb or keto? The custard part of this dairy free creme brulee is easily adapted to be keto friendly by subsituting a sugar-free sweetener for the sugar. You’ll have to skip the “brulee” part, unless you have a low carb sweetener that will carmelize like sugar does. If you are looking for more creamy keto dessert recipes I think you’ll love this easy keto chocolate mousse. It is made in the blender! To make your dairy free crème brulee creamy and silky, like a traditional crème brulee, the dairy free milk you choose is very important. I used canned coconut milk in this recipe because it is thicker and has a higher fat content, similar to heavy cream. There is a bit of a coconut flavor, but you can help to disguise the coconut flavor with a little extra vanilla. I splurged and used a vanilla bean in my dairy free vanilla custard. The flavor is amazing! However, I’ve also made this dairy free vanilla creme brulee with vanilla extract and/or vanilla paste. Vanilla paste will get you those pretty vanilla speckles and no one will know that you didn’t splurge on a vanilla bean! 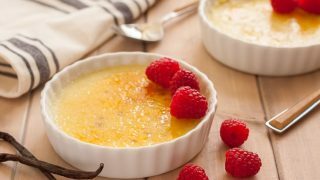 Instant Pot Dairy Free Crème Brulee, or Oven-Baked? 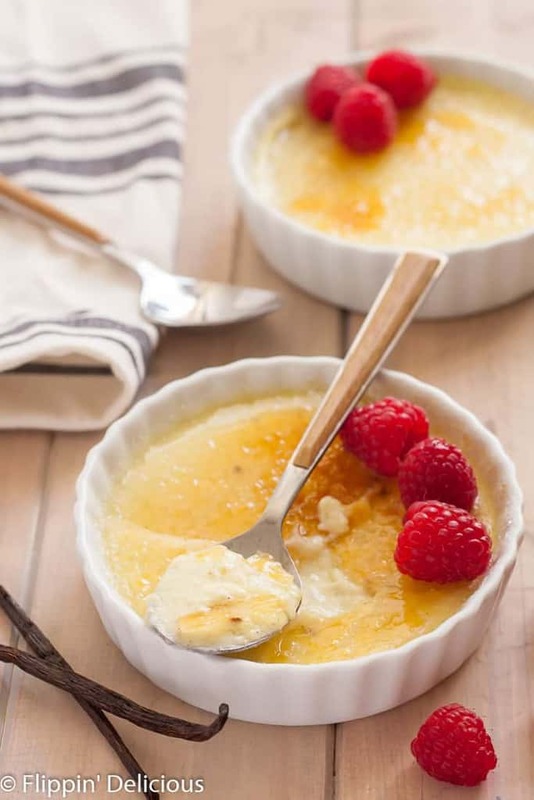 Crème brulee custard cooks best when you place it in a water bath. The water helps the custard to cook and set evenly, preventing cracking as it cools. I like using my Instant Pot to cook my crème brulee. It takes just a few minutes and is perfectly cooked. 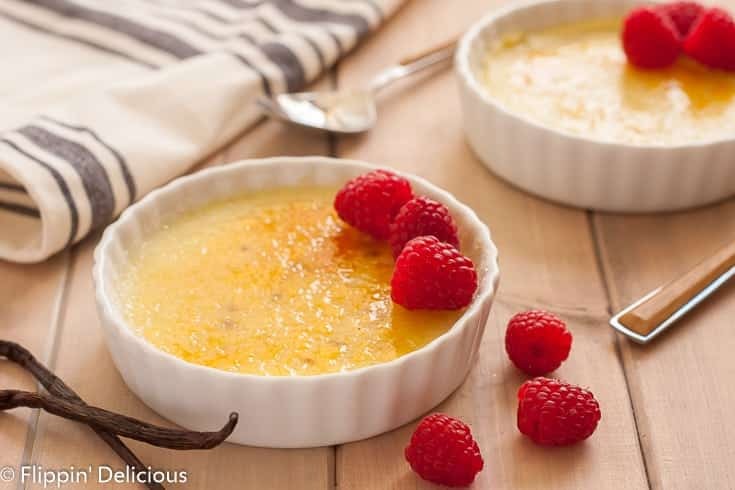 If using an Instant Pot be sure to tightly wrap your crème brulee ramekins so that water doesn’t get in the custard. If water splashes in, the custard won’t set. I’ve included instructions for baking in the oven or in an Instant Pot so you can use whichever method you prefer. The secret to getting the perfect brulee on your crème is to use a blowtorch. You can use a broiler, technically. I’ve tried to use a broiler to caramelize my sugar, but every time I have my crème has turned to soup! You can purchase a crème brulee torch on Amazon, it is useful for so many things beyond crème brulee. I also use mine to make S’mores and to crisp of skin on poultry or brown meat. The other secret to a good caramelized sugar on your brulee is how much sugar you add and ensuring it is spread evenly. To coat the top of your crème with sugar, make sure it is dry (meaning no condensation has settled on the surface of your custard). If there is some water, gently blot it with a paper towel. Add a teaspoon of sugar to the center of your custard and gently tip and rotate it so that there is an even layer of sugar across the top of your custard. You want to avoid any gaps, because anywhere there isn’t sugar the custard will melt when you apply the torch. If there is too thick of a layer of sugar it will take so long to melt it will burn. No one likes burnt caramel on their crème brulee. Using a superfine or “caster” sugar will melt easier. I usually use normal granulated sugar with fine results, but if you want it to melt easier pulse it in a food processor or blender so the sugar grains are smaller. Smaller sugar grains means they will melt easier and caramelize without burning. On to the Dairy Free Vanilla Creme Brulee Recipe! Split the vanilla bean in half and scrape out the seeds. Discard the bean it self, using only the seeds you removed. You can add the bean to a container of sugar to make vanilla sugar, if you'd like. You have covered all the bases here and this looks delicious! Honestly, this recipe does NOT work at all in instantpot. I made it for friends yesterday, and 9 minutes was nowhere enough. Then tried another 4 minutes, and a bit better but still not really set. I would recommend you try it again and see if it actually works. And yes I did the long natural release (took like 45 minutes).